KMT Genuine Parts are manufactured in the USA to the exact standards as the original parts found on new KMT pumps. Our expertise and operating experience extends from the original SL-I operating at 3,800 bar all the way to today’s industry-leading KMT PRO pumps cutting at 6,200 bar. No other provider has this breadth of experience and you can rest assured that your KMT pump will operate at peak performance when you use KMT Genuine Parts. Remember to use KMT Genuine Parts to maintain your pump warranty and ensure that your investment pays off over the long-term. The use of imitation parts will void warranty coverage, compromises safety and may result in reduced component lifetime. 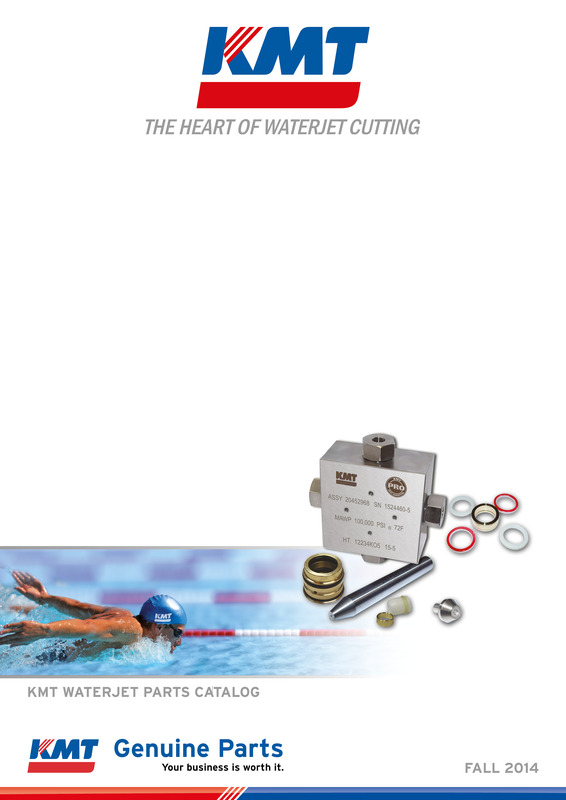 In our spare parts catalog, you’ll find comprehensive details concerning our product range – from spare parts for intensifiers to cutting heads to installation material, the catalog offers everything you need to run your waterjet cutting system smoothly. Order your hard copy now. or in our Spare Parts Catalog "KMT Genuine Parts"
KMT Waterjet Spare Parts Catalog "Genuine Parts"